Studies and surveys consistently show that most of us are not getting enough sleep each night. And while modern technology such as smartphones are often implicated as one of the culprits keeping us up, the truth is that there are many apps out there that can actually improve your sleep. This article details ten great apps that can help you get a better night’s sleep. This app was initially created for research at the University of Washington. This app notifies you when you should take a nap, exercise, relax, eat, take caffeine, or go to sleep. All of these activities have an impact on your sleep, so keeping track of when you do them can help improve your sleep. This app helps by increasing your awareness of your habits and how they affect your sleep. This app claims to track your sleep cycle based on your body movements. The app uses this information to wake you with an alarm at the best time during your sleep cycle. The idea is that if you are awakened when you are in your lightest stage of sleep, you will be less disrupted by being awakened. The app uses the accelerometer to measure your body movement. Similar to SleepCycle, this Android app aims to wake you at the optimal time. The app also includes the ability to record the sounds you make while asleep and allows you to rate and comment on your sleep. It even includes music to help you get to sleep. 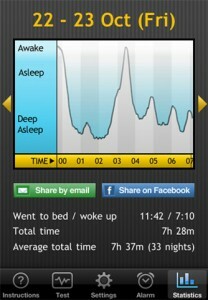 This iPhone app is a test for sleep apnea of sorts. The app allows you to record audio of yourself sleeping, and then compare that audio to recordings of people who have been diagnosed with sleep apnea. By comparing the two, you can determine if there is any similarity and whether you should seek further testing for sleep apnea. This app helps you get to sleep by playing ambient sounds while you fall asleep. The app includes 70 different sounds that include crickets chirping, running water, birds singing, and rainfall. The app has the ability to layer different sounds over each other to create custom relaxing melodies. This is a great app if you have trouble falling asleep in silence. Like Relax Melodies, this app is an ambient noise generator. This app is multi platform, so you can use it no matter which smartphone you have. This is a sleep journalling app for the iPhone. It lets you record how long you slept and how you feel afterwards. Journalling is a great way for you to notice patterns in your sleep and mood. This app presents your info in an easy to reach chart, which helps you spot patterns. This app is similar to Sleep Tracker for the iPhone. It is a sleep journalling tool that lets you record mood, notes, and sleep times. The sleep tracking function uses a simple clock-in and clock-out interface and includes a sleep questionnaire. This app digitizes the old standby of counting sheep to fall asleep. The app has sheep jumping over a fence while it plays soothing music from the app or your own tunes. The screen is dimmed to avoid keeping you awake longer and you can set the app to automatically turn off after a certain amount of time. This upcoming app aims to test your alertness levels by testing your response time. Great for late night driving, this app can let you know when it is time to pull over and get some rest. The tests are based on the Psychomotor Vigilance Test. So rather than using your smartphone to keep you up all night playing games and surfing the internet, download these app and turn your smartphone into a powerful sleep aiding tool. To find the apps just search for their names, and you should be able to find them. Please be aware that some of the apps do cost. Thanks for the list of sleep app tools. I’ve been working on my new website so much that I definitely need them. I wonder how they actually track your sleep cycles? That would make for an interesting article. Good luck on your new site Rob. I would agree how your phone can track your sleep cycles would make for interesting reading, but I am not sure I could write that! I would be a little concerned about strapping my iphone to my arm before going to bed. I would probably stay awake concerned about rolling on it and damaging it. That is a point Neil, I am not sure I would want to either! Nice, I am going to try a couple of these out, the sleep as android app, has a 2 week trial so it will be cool to try it before i buy it. I like the potential too Deborah, but do we really want to be told when the optimum time for us to sleep is? I use SleepCycle and it’s pretty good, although you do have to remember to start the app every night before you go to sleep otherwise your alarm won’t go off! Another good one I sometimes listen to before I go to sleep is the Relax app with Andrew Johnson which helps me get to sleep.